Steven Spielberg called the alien puppet for E.T. : The Extra-Terrestrial "something that only a mother could love." And a good deal of concept art went into creating that cute and ugly creature and getting its expressions just right. 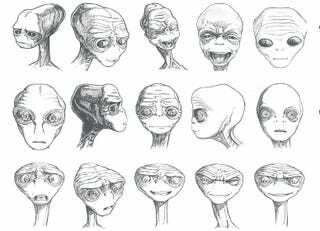 Production designer Ed Verreaux, who worked with Spielberg on the Indiana Jones movies, Poltergeist, and Empire of the Sun, created a series of sketches that not only riffed on the idea of the big eyes, fleshy head, and scrawny neck, but also mapped out a series of possible expressions for E.T. After all, the puppet would need to be able to convey all of the emotions required in the film. 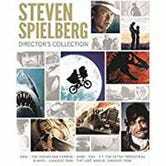 Empire Online has a larger series of Verreaux's illustration sketches, released in anticipation of the Steven Spielberg: Director's Collection Blu-ray box set. Head over there to see the whole thing.